A golden retriever is lucky to be alive after being rescued on the Chemung River in New York State this past weekend. 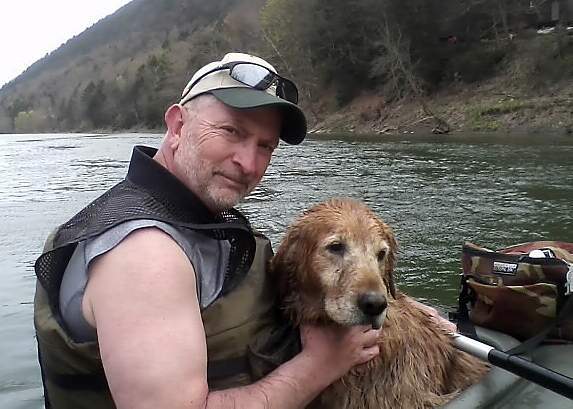 The dog was struggling to keep above water and stay near a small island in the river when Joe and Amy Longwell spotted him from their kayaks, and if it were not for them he might not have made it. “My wife and I always say that we see something different every time we kayak on the Chemung River, and (Sunday) was no exception,” Joe said. He and Amy had just maneuvered a tricky spot on the river and were congratulating each other when Amy spotted the dog, who they first named “Lucky”. “I don’t know how I happened to spot him,” Amy said. “We had to do something.” “We paddled over to the island and tried to stop ourselves alongside the dog. He was clearly exhausted and we could tell from the white fur on his snout that he was not a young pup,” Joe said. The name Lucky changed to “Notso” after they realized his poor condition on Sunday evening. He had a hard time getting up and around but did manage to eat and drink and seemed much better after a long sleep. The Longwell’s already have an elderly dog and cannot keep him so they are hoping to find Notso’s owners and reunite them. If they don’t he will end up at the local shelter. has anyone considered maybe he was with his owner and the owner has drowned? Maybe had some troubles manuevering that “tricky spot” that they had mentioned just before they found the dog..
Good Day! I hope you and the dog are enjoying some pleasant moments. I can totally take him in, to keep, and/or foster. I live nearby in Owego… and I’ve a lot of time to devote to him. He looks like a Senior, and Seniors are my Specialty. I just fostered and found the perfect home and family for a Senior Labradoodle named Emma. I’ll call and write to the listed contacts. That will be amazing. Hope it all works out. Please keep us updated on this! I would love to know if Lucky has found a good home with you! Yeah John V.B. If I didn’t live in CANADA I would take him in in a heartbeat. If the owners haven’t been seraching for him, putting up flyers and leaving info at Humane Society they don’t deserve him, I lost my Golden at 10 to cancer, and I miss him every day! AS far as ASH’s comment don’t you think there would be a canoe,boat or some evidence to back up the owner drowning?? Please don’t give these people a hard time. They risked their lives to save this dog. I work at a Shelter and we have many elderly dogs that were taken from a hoarding situation. We have managed to place most of them and the rest of them will stay here until we find homes for them. Although we would love to, we can’t take them all home and I’m sure these nice people would keep him if they could. Sometimes circumstances don’t allow it. And…..please don’t criticize shelters in general. They do the best they can and unfortunately, euthanasia is unavoidable. Let’s not place blame on the Shelters when the real problem is people who don’t spay and neuter their pets. What is the follow-up on this puppy? Was the owner found? Did someone take him in? Please let us know! I was told they have found his owners is this true?